I'm trying to figure out a way to make a chapter index appear on the side of my document instead of on the actual document page. Microsoft calls it "Navigation Pane" and I heard LibreOffice offers the function I'm looking for, but I can't seem to figure it out. In LO the pane containing this type of information / utility is referred to as the Navigator. Thank you! That's exactly what I needed! But is there a way to make it so the index doesn't also appear on the document itself? 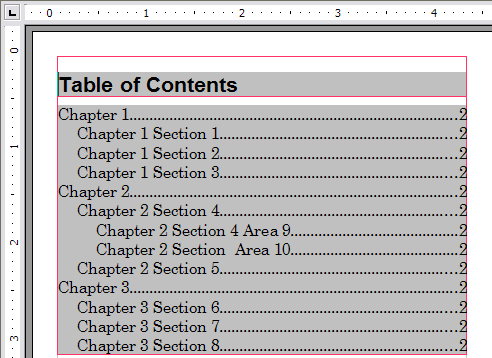 The navigator pane content is based on document content i.e., heading styles and types of inserted elements. The pane itself is not saved in the document but rather is an alternative view / tool for managing document content. Oh, well I meant not having an index like this present in the document in order to use the navigator. I couldn't figure out how to make chapters/sections/headers without the index being pasted into the document. But the wikia you listed helped a lot (just finished reading through more of it)! I can make headers/chapters for the pane without the index taking up space in my document.